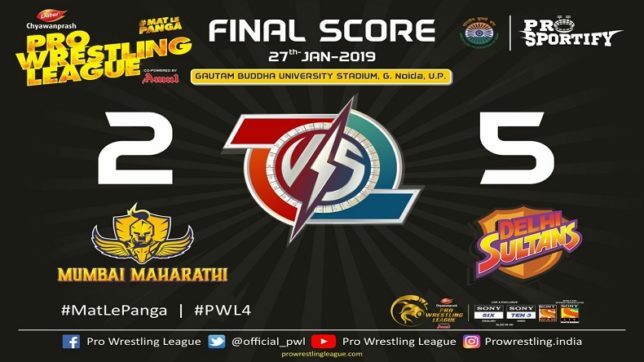 On the day 14 of Pro Wrestling League, Delhi Sultans will battle it out against Mumbai Maharathi in order to bag victory and level up their position on the league points table while on the other hand Mumbai Maharathi’s will be looking forward to snatching a victory and finalise their place in the semifinals. Maharathi is in fine form lately having thrashed Haryana Hammers in their last outing. Mumbai starts favourite in this tie, a tough contest is expected in the men’s 86kg and women’s 57 and 76 kg categories. In the men’s 86kg category Delhi Sultans’ Praveen will lock horns with Deepak Punia of Mumbai who have caused quite a few upsets this season. It is an excellent opportunity for Deepak to settle some old scores with Praveen who defeated the former during the national championships last year. As we head towards the fag end of #PWLSeason4, have a look at how the teams stand. Mumbai’s Betzabeth Angelica takes on Katherina Zhydachivska of Delhi in the women’s 57kg category. Both Katherina and Betzabeth had made it to the medal rounds of the world championships and Rio Olympics respectively. However, both of them are a little low on self-esteem at the moment having lost to Indian wrestlers in earlier bouts this season. Anastasia Shustova wins the Player of the match award for a superb performance against Zseneth Nemeth. Great start for Andrey who notches up 4 points to take the lead with a minute remaining in the match and bout. Harphool pushes out Andrey to reduce the lead to 2 points. Andrey wins the bout by a score of 4-2. Delhi Sultans wins the match 5-2 on bouts won. A slow start to the bout as Andrey receives treatment for a cut on his head. Both the wrestlers are getting physical and Harphool scores the first point of the bout. The round ends 1-0 for Harphool. Vinesh takes the lead early on with a 2 point move and follows it up with another 4 points but Pinki who was close to pinning Vinesh but only manages to win 4 points to harbour some hope of a comeback. Pinki equalises in the closing seconds but after reviews, Vinesh is adjudged the winner by a score of 14-9. Pinki attacking intently to win 3 points while Vinesh has 2 points early on in the 1st round. 2 points for Vinesh after a good move. 2 points for both the grapplers as the 1st round culminates with a level score of 5-5. The superstar Vinesh Phogat will go up against Pinki from Delhi Sultans in the second-last bout of the night as Delhi lead 4-1 on bouts won. Deepak Punia opens the scoring with 2 points after which both the grapplers are awarded 2 points each with a minute remaining in the round. Deepak extends his lead to end the round ahead by 6-2. Deepak Punia will have to compete with Praveen in the 86 Kg men's category in the 5th bout of the night. Delhi has taken an unassailable 4-0 lead with 3 bouts remaining. Sakshi Malik starts off again with 2 points but Shilpi registers her first points of the bout. Sakshi extends her lead to 10 points with a minute remaining. Sakshi has 2 more points as the round ends 16-2 and Delhi secure the match. Sakshi Malik starts as a favourite and she begins in that way winning 2 points. Sakshi strengthens her position with 2 more points. Sakshi wins 2 more points as the round ends 6-0. Sakshi Malik will face Shilpi in the 62 Kg women's category as Delhi look to seal the match after taking a 3-0 lead with 4 bouts remaining. Ibragim stunningly pouches 3 points but Pankaj hits back to level the scores. Pankaj coming on strongly and takes 4 points while Ibragims gets 1 point. Pankaj wins the bout 11-8 and extends Delhi's lead to 3-0. Ibragim scores first but Pankaj hits back immediately with a 4 point move after which Ibragim is given another 2 points to take the score to 4-3 with 30 seconds remaining. Pankaj takes the round 4-3. Ibragim Ilyasov will face Pankaj in the men's 57 Kg category in what will be the 3rd bout of the night as Delhi lead Mumbai 2-0 with 5 bouts remaining. Zseneth starts off strongly with 4 points to extend her lead after which Zseneth required some treatment. Anastasia performs some extraordinary moves to increase her points tally to 8 points to move into the lead. Anastasia growing into the game and wins 2 more points. Anastasia brilliantly beats Zseneth by a score of 10-5. Zsanett Nemeth takes on	Shustovo Anastasia in the 2nd bout of the night after Khetik's win gave Delhi the lead in the match with 6 bouts remaining. A slow start to the first round with no points scored in the first 2 minutes but Khetik takes a point for Rathi's passivity in the final minute. The round finishes 1-0 in Khetik's favour. Delhi's skipper Khetik Tsabalov will take on Mumbai's Sachin Rathi in the men's 74 kg category in the 1st bout of the night as both teams chase a win to get them closer to the semi-finals. Delhi Sultans wins the coin toss and has decided to block 125 Kg men's category as their opponents Mumbai Maharathi choose the 57 Kg women's category in the penultimate match of the group stages in PWL Season 4.